In the past I was able to teach the Buddha’s Dharma throughout the day without ever mentioning him or using a Pali or Sanskrit word. I’ve given up on that. Once the Buddha is taken out of the equation people are free to twist the teachings anyway they want to because the teaching has no context. I’ve seen psychoanalysts of all stripes damage a patient’s life by using Dharma teachings secularly avoiding what might be perceived as a religious connotation. Whether or not “Buddhism” is a religion or not is a matter of interpretation. As a practitioner of the Dharma I find the Buddha is immensely important to me. It is after called Buddhadharma. If we can all agree that these teachings originated with the Siddhartha Gautama then the importance of the Buddha cannot be over estimated. It is true that Dharma, as taught, is to be used in secular settings but I am just a tad skeptical of a secularized Dharma having great long lasting value. If one cannot handle their own perception of a religion called “Buddhism” then that is on them — it is their karma. Buddhism as a word came into being around 1812, before then it was just called Dharma or “the Way”. I teach a teaching and a practice while trying to avoid the usual concepts others might have of a religion. In Vajrayana training we might find the religious iconography is necessary. Let’s not forget, though, we are not talking about living and breathing beings here. We are talking about imaginative symbols. To paraphrase Nāgārjuna, we ought not mistake the symbol for its meaning. Some students are not wholly comfortable with the orthodox Pure Land and Vajrayana view as described by orthodox practitioners, persons who see Amida Buddha, and other Cosmic Buddhas and Bodhisattvas as a sort of previously real and existent persons who lived and died and created a special place in the universe, Western paradise, for example, where we can go, never to be reborn into samsāra, until we have cleared our karma and move into nirvana and finally enlightenment. I find myself in full agreement with these students who are uncomfortable with that teaching. The usual presentation of Amida or Amitābha Buddha and the rest does come off like a tribal fairy tail told in some religious settings. The truth is much deeper and more profound than that. Let’s look at Amida Butsu. Upon close examination of the Dharma teaching it is easy to see that he is not meant to be seen as a physical being nor is the Pure Land to be viewed as a geographical location. Amida is the personification of the purified mind. When the mind is freed from attachment, aversion and basic ignorance then it is a pure mind. When the mind is pure then the “land” is pure. The “land” in question is simply the landscape and geography of human experience. With a pure mind human experience becomes freed from greed, obsession and mental fabrications leading to stress and suffering. Amida is a symbol of a much greater reality. When we visualize him we are “tripping”, as we used to say in the 60s. It is a mental creation and not a person. Yet the image we imagine is a “being” in the sense that it is in the process of being, existing, in our imagination. It is not a sentient being so much as it is our “sentience that is being”. There exists a profound difference between the English phrase “sentient being” and the Buddhist concept of “being sentient”. In the practice we become “sentient beings who are being sentient” of what is being experienced. This is not a difficult leap but very different from our normal approach to experience. That we are examining two different modes of existence is clear in light of the Samdhinirmocana Sutra, which describes the Third Turning of the Wheel. Unlike the traditional Jodo Shin Shu and Jodo Shu presentation of a living being called Amida, with a complex definitive history, and geographical locatable “Western Pure Land”, it is Hongaku Jodo’s position that it is we who manifest Amida and not the other way around. He does no manifesting within us. We do this because of the “emptiness nature” of the universe, which is also our own “Buddha-nature”. It allows for change in any given direction. The idealized personification of infinite wisdom and compassion is then what we hope to realize in ourselves; to realize it is to make it real in our lives. This is why we make these objects of our aspiration symbolically “real” as a personification. There is no “other-power” outside of our creating it — fabricating it. The other-power is already deeply ingrained within us — we are both other-power and self-power. If we relinquish or minimize the self then the self-power is minimized. The other-power then must appear in the absence of a demanding, needy, high maintenance self. When we call upon the other power we are calling upon our own innate also called Hongaku, primordial emptiness that is our other-power, the power to see clearly. 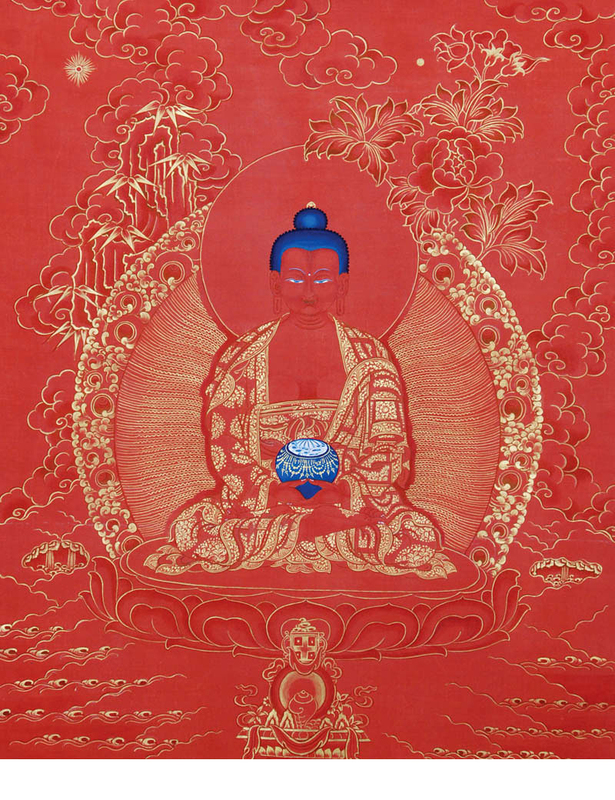 This means the chanting of the name, Amitabha Buddha, or the mantra, om ami deva hrih, is a prelude to setting the mind to the process of conditioning itself to get out of the way so we can engage life mindfully, meaningfully and compassionately. This is called shamata or “calm abiding” meditation. It allows the mind to relax, expand and liberate itself from the tension it harbors in its usual state. It sets us up for deeper meditation and mindfulness practice both on and off the cushion. Both the suttas and sutras are rife with symbolism. One very subtle symbol is also one that is quite often misunderstood by casual and curious non-practitioners and sometimes seasoned Dharma practitioners alike. It is the idea that enlightenment, parinibbāna, equates with non-existence. Who said that upon reaching enlightenment that we would cease to be? It might have been the same teacher that mistakenly told his students that nothing exists because he thought the Heart Sutra said so. In either case he would be wrong on multiple levels. We tend to think of not taking rebirth as meaning that we will no longer exist. It’s similar to the fear that tells that because of emptiness we do not really exist. There is a common belief that the goal of the Arahant, not taking rebirth in Samsāra, is, in some way, equivalent to being annihilated: the expunging of the self is somehow the same as not being. This belief brings us to the brink of nihilism, a un-Buddhist notion to be sure. Not taking rebirth means not being born into the six Samsāric realms. It does not mean that anyone ceases to exist. It means existence in a different way. If you look at a standard Samsāric wheel, you will se the Buddha is in every realm and outside of every realm at the same time. That is meant to symbolize that upon parinibbāna the Buddha is still very much in existence and is everywhere at once, manifesting as he chooses. It symbolizes the energy of being and mind stream, which was never separate from the universe, the Dharmakāya. The enlightened realization is also inseparable from the universe in its perfected awareness. Because of our karma we are stuck with this body that transports us around. We are so used to it we habitually think of our body as being who and where we are. When you dream you find that you don’t need your body, you are only used to it. In dreams you see, feel, taste, touch, smell and think even though your senses are shut down. This infers that the body is not who we are nor is it where we are. Because of our karma the clinging aggregates form our body and, yes, our various minds. The conditioned mind believes it is this fabricated body it perceives. The unconditioned, enlightened mind, has realized, that is, made it real, that it is not. Mind is already everywhere — it is not localized in a geographical locatable place any more than are the multitude of Pure Lands we speak of. The aggregates form around our clingings and cravings and create a self of which the mind is only a part. We do not inherently have a “soul”, we create our “soul” during our lifetime. This is why in Zen they speak of a small “self” and a large “Self”, while other practitioners talk about “the mind of…” meaning a fabricated and conditioned mind, versus just “mind”, the unconditioned mind. The mindful ones exert themselves. They are not attached to any home; like swans that abandon the lake, they leave home after home behind. Those who do not accumulate and are wise regarding food, whose object is the Void, the Unconditioned Freedom — their track cannot be traced, like that of birds in the air. Even the gods hold dear the wise one, whose senses are subdued like horses well trained by a charioteer, whose pride is destroyed and who is free from the cankers. There is no more worldly existence for the wise one who, like the earth, resents nothing, who is firm as a high pillar and as pure as a deep pool free from mud. Here he speaks of tracks and trances again. Those who attain enlightenment leave no tracks or traces like the birds of the air. Birds fly through the air and leave no trace of their flight. Still, there are birds — we can see them as they fly across the sky — they do not cease to exist simply because there is no trace in the sky. Likewise the Arahants (fully enlightened human beings) do not cease to exist because they have freed themselves from attachment and ignorance. They merely leave no trace of themselves because they have realized “no-self”. Verse 95 is a key teaching about this. “There is no more worldly existence for the wise one…” The Buddha defined the world as entrapment in mundane human experience enslaved by attachment, aversion and ignorance. This does not indicate that they have disappeared or even died. He is talking about living and breathing people who are not trapped in samsāra. To be “reborn no more” is not an indication of absence life; it is an engagement “in “life as opposed to “with” it. An enlightened mind is not separate from the life he or she experiences. Life and the Arahant are one and not two. The same is true after a Buddha experiences parinibbāna. The swans leave home after home, so do enlightened beings. They are constantly being born into a different mode of existence, but not into worlds. Life, that is, existence, is a universal principle. So, after parinibbāna one is not absence from existence, one is one with it. It is not so much about existing or not existing so much as it is about modes of existence. That is the beauty of emptiness and the two truths. This entry was posted in Buddhism, Core Teaching of the Buddha, Hongaku Jodo, Meditation, Pure Land Buddhism, Rational Amidism and tagged Amida Buddha, Amitabha Buddha, Becoming, Compassion, Emptiness, Meditation, Practice, Rational Amidism. Bookmark the permalink.